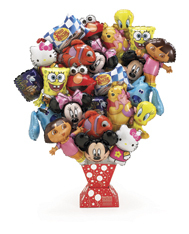 Foil balloons are also available in 2", 4" & 9" round shapes and 5", & 9"-14" shapes. These mini foil balloons are designed to be filled with air, heat sealed with a heat sealer, and attached to a plastic cup and stick. They may be purchased preinflated (air-filled) which means that they have already been filled with air, sealed, and include a cup and stick. Assortments are available with or without displays or certain styles can be purchased by individual stock numbers. 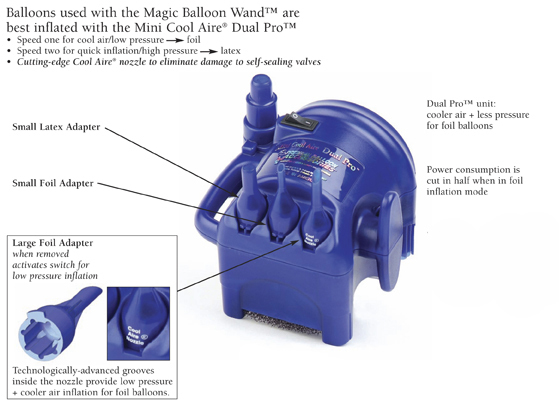 When mini foil balloons are purchased flat, an electric air inflator is required for inflation. Please note that foil balloons smaller than 18" should only be inflated with air since smaller sizes will not float with helium. We recommend an electric air inflator such as the Cool Aire® Inflator 831. This inflator has several nozzles to use depending on the size of the balloons, and comes with a heavy-duty handle for easy carrying. It also will run continuously without over heating. 1. After inflating the foil balloon, firly hold the stem in one hand so the air cannot escape. Use your other hand to flatten the balloon stem. The stem should be free of wrinkles, creases, and dust. 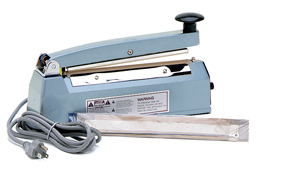 The heat sealer control should be set at a position between 2 and 3. 2. Position the flattened stem under the upper bar of the heat sealer so that the seal will be made just above the inflation opening in the stem. Press the bar down and hold for 4-5 seconds while slowly pulling the neck through the sealer, then release the upper bar. 3. The red light will confirm proper heating element contact which is critical to ensure proper sealing. The pad protecting the element will wear thin after much use. When replacing with a new pad, also replace the element. Unplug the heat sealer before replacing pad and element. After inflating and sealing mini foil balloons, they can then be attached to a cup and stick, which are purchased separately. The type of cup and stick to use will depend on the size of the balloon and its end use.